Harry D. Batjes was born on July 10, 1939 in Pound, WI to Andrew and Emma (nee Lentz) Batjes. 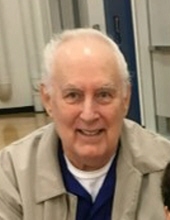 He died peacefully Tuesday, April 9, 2019 in Arlington Heights. Mr. Batjes served in the United States Army where he was trained as a radio teletype operator. Harry worked as a printer for R.R Donnelly and Sons in Chicago for 36 years. He was a member of St. Peter Lutheran Church in Arlington Heights. Harry was an avid Chicago Bears and Cubs fan, loved to work crossword puzzles and he liked to reminisce about his high school football days as a wide receiver. Harry loved to attend his grandchildren's activities and was recognized as "Super Fan". Harry is survived by his wife of 55 years Hattie (Doering); children, Julie (Craig) Bowers, Kathleen (David) Wright and Susan (John) Dattilo; grandchildren, Angelo Coniglio, Rachel Bowers, Emily Dattilo, Julia Coniglio, Sarah Bowers, Johnny Dattilo and Elyse Dattilo; siblings, Dolly (Larry) Vaupel and Frank (Carole) Batjes; and many nieces and nephews who loved their "Uncle Harry". He was preceded in death by his parents; and siblings, Edward (Doris) Batjes and Henry Batjes. Visitation Friday, April 12, 2019 from 3:00 pm until 8:00 pm at Glueckert Funeral Home, Ltd. 1520 North Arlington Heights Road (4 blocks south of Palatine Road), Arlington Heights, IL 60004. Funeral Services and Interment will be private. "Email Address" would like to share the life celebration of Harry D. Batjes. Click on the "link" to go to share a favorite memory or leave a condolence message for the family.